Have you heard that Nicole of Baking Bites has just put out a cookbook? This made me really excited because hers is one of my favorite blogs, and the cookbook promised lots of brand new recipes! I was delighted when the copy I'd ordered arrived, with lots of full color photos and amazing-sounding recipes. 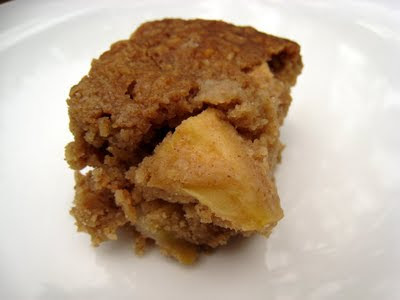 The first one I tried was the apple cobbler bars, which I have to say definitely lived up to everything I was expecting! They're perfectly spiced, moist, and full of apple flavor. These really are like apple cobbler made into a cake! They're sweet enough for dessert, but also good for breakfast. Finally, they're super easy to pull together, with ingredients you're likely to have around the house. Sadly my photo doesn't really do the bars justice (it was a really cloudy day), but I definitely recommend trying them out! Preheat the oven to 350 degrees. Lightly grease an 8- or 9-inch square baking pan. In a small bowl, whisk together the flour, oats, baking powder, cinnamon, nutmeg, and salt. In a large bowl, cream together the brown sugar and butter until light and fluffy. Beat in the egg and vanilla, then stir in the flour mixture until just combined. Add the apples, and stir to combine. Spread the batter into the greased pan. Bake 35-40 minutes, until a toothpick comes out clean. Cool before slicing and serving. Delicious looking apple cobbler Sara. Make me want to make one myself now. I love a recipe that you can eat for dessert and for breakfast! These look delicious.